Mother’s Day is right around the corner. I wanted to make mom something special that she could not get just anywhere. I’ve also been playing a bit with polymer clay techniques. So, let’s combine the two! Here is an easy to make and unique gift idea for Mother’s Day; a Marbled Gift Set including trinket dishes, a marbled frame, and a little marbled bird house! This project took me just an afternoon to make and I know my mom is going to love it. 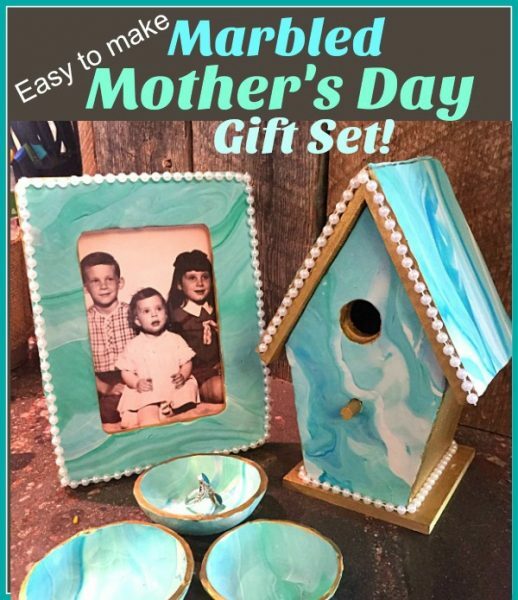 This fun matching gift set would look amazing in her bathroom. Want to know how to make a set of your very own? 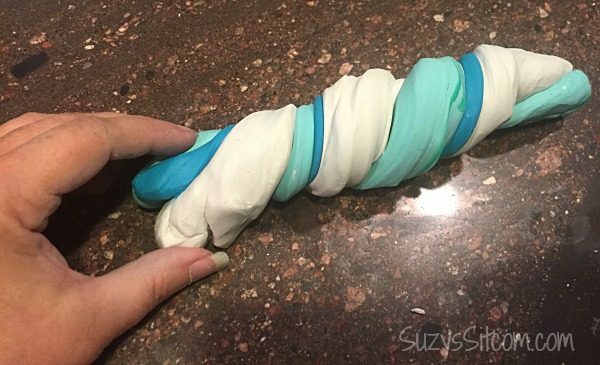 I used a larger amount of white polymer clay and a bit of green and blue to create the marbled look in my project. 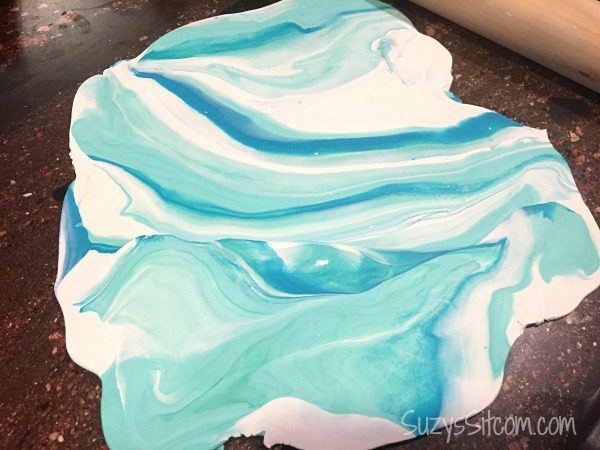 You can use any colors that you love to create a marbled look that is quite different. That is one of the fun future ideas of this project! Warm up the clay in your hands, and knead it. I found it easier to work with directly on my countertop. Simply wipe everything down with a cleaner afterwards. Twist the colors together. The more you twist, the better. Roll the clay out to about 1/4″ thick. If you do not like the marbling, then fold it and roll again. 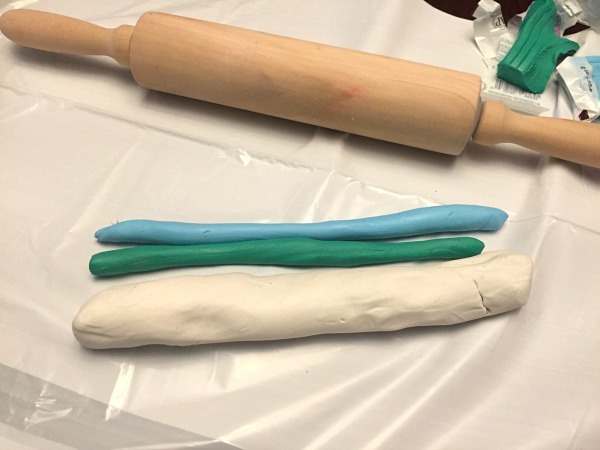 (I used a rolling pin that is meant only for my polymer clay projects). Use a round cookie cutter or the top of a large cup to cut out your trinket dishes from the rolled out clay. I used rounded cups and custard bowls to shape my trinket dishes as shown above. 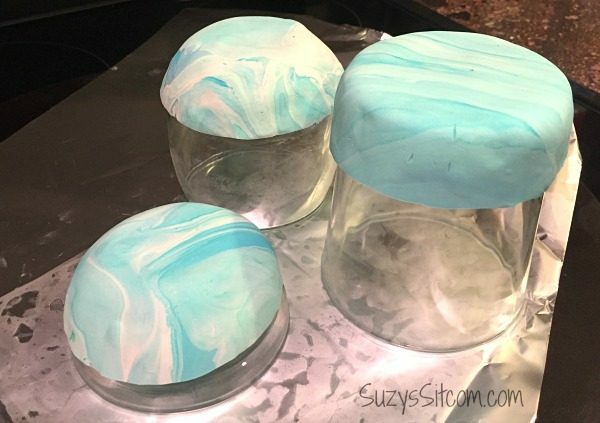 Be sure to use glass as you will be baking the clay and the glass dishes together. Roll out more marbled polymer clay. Lay the frame on top and cut around it. Do the same with the bird house, cutting out two pieces for the roof and a piece for the front of the birdhouse. Use a craft knife to cut out the hole in the front. 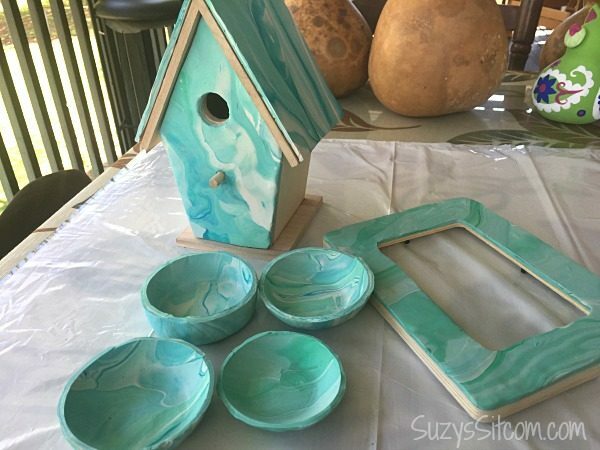 You will be baking the clay pieces along with the wooden bird house and wooden frame. Place your clay pieces on aluminum foil on a cookie sheet. Set your oven for 200 degrees and place them inside for about 45 minutes. Allow them to thoroughly cool before going to the next step. Once the clay has cooled, remove the trinket dishes from the glassware. 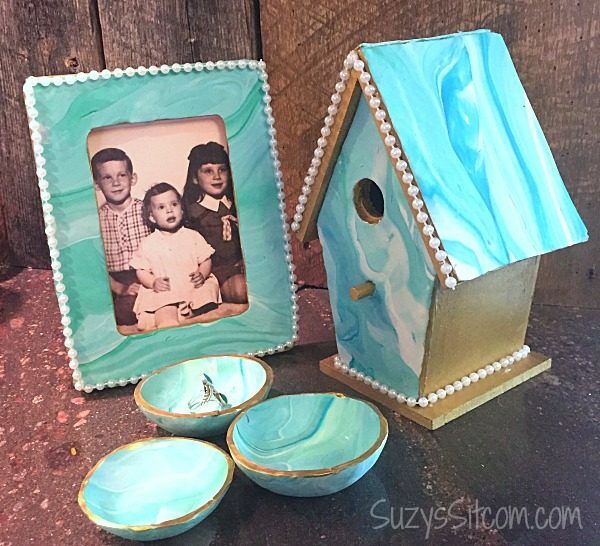 Use E6000 glue to glue the marbled clay to the frame, and the marbled clay to the bird house. 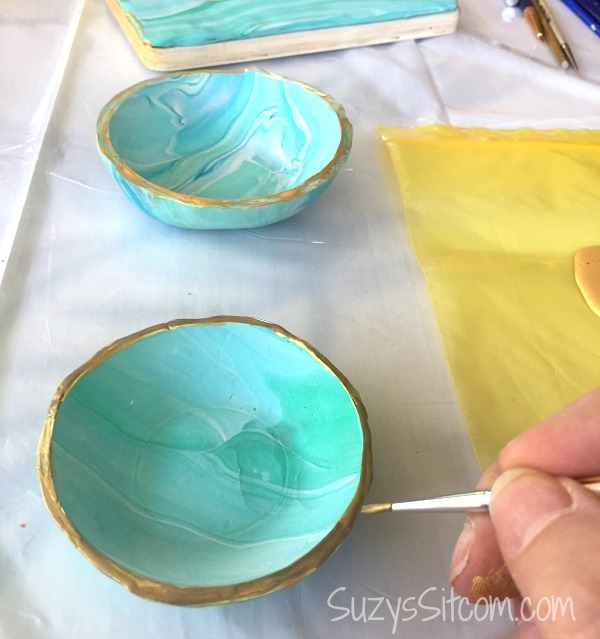 Paint the edges of the trinket dishes with gold acrylic paint. It will take about two coats. 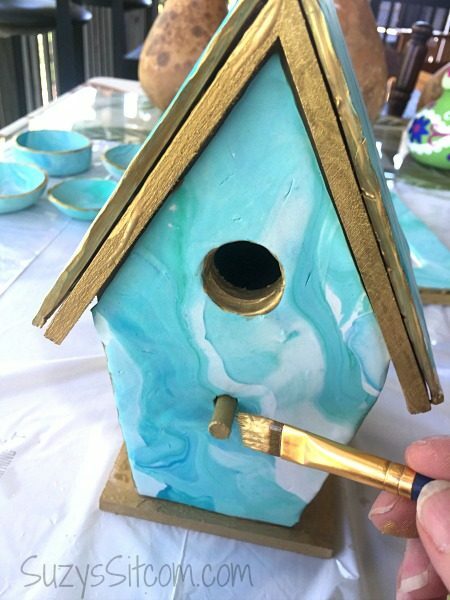 Paint the edges of the frame and details on the bird house with the gold acrylic paint. Use E6000 glue to glue on the plastic bead necklaces along the edges of the frame and base and roofline of the bird house. Finish with a coating of polymer clay glaze on all of the clay. This will not only seal the clay, but give it a beautiful finished look. For Mom, or as a housewarming gift, birthday gift, or just something fun for yourself. 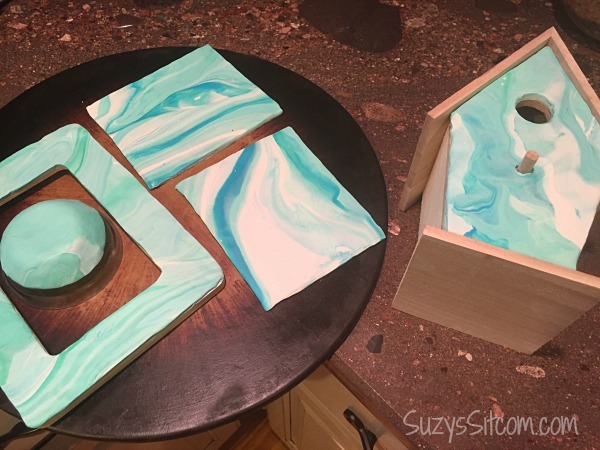 This is a simple project with beautiful results! 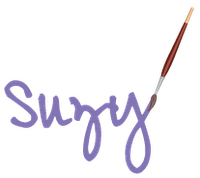 For over 200 more tutorials for all ages, be sure to visit my Tutorial Page! Previous post: 6 Unique ways to create with paper!